It is as if you are looking into an aquarium. Two trout swim upstream surrounded by the natural rock formations on the bank. The carving of this from a solid piece of D2 steel is most impressive. 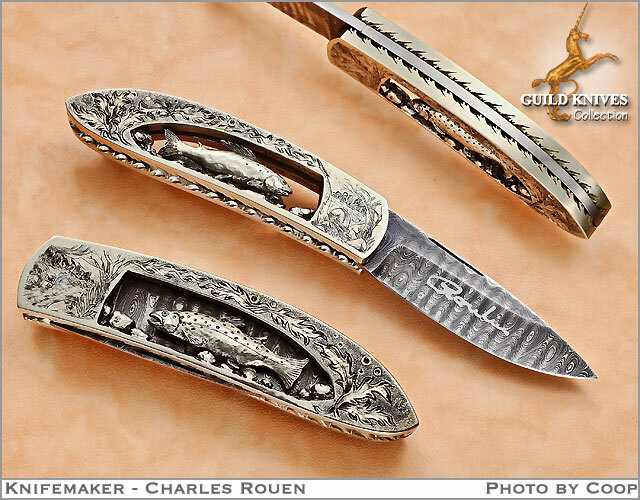 Roulin has engraved the bolster in a fishing scene with a flowing river. Filework top and bottom with a damascus blade. This Swiss artist does masterful carving from a solid chunk of D2 steel. D2 steel engraved in mountain scenes on both sides.